Sub: Seventh Central Pay Commission's recommendations - revision of pay scales - amendment of Service Rules/Recruitment Rules. 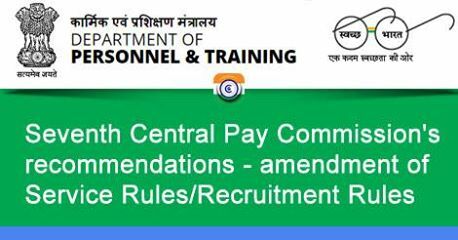 The undersigned is directed to refer to this Department's OM of even number dated 9th August, 2016 regarding amendment of Service Rules/Recruitment Rules by replacing the existing Pay Band and Grade Pay with the corresponding Level in the Pay Matrix in the revised pay structure recommended by the Seventh CPC and notified in the CCS(Revised Pay) Rules, 2016. Ministries/Departments. These are annexed at Annexure I and Annexure II. "Note: For the purpose of computing minimum qualifying service for promotion, the service rendered on a regular basis by an officer prior to 1.1.2006/the date from which the revised pay structure based on the 6th CPC recommendations has been extended, shall be deemed to be service rendered in the corresponding grade pay/pay scale extended based on the recommendations of the Commission"
"Note: For purposes of appointment on deputation/ absorption basis, the service rendered on a regular basis by an officer prior to 1.1.2006/the date from which the revised pay structure based on the 6th CPC recommendations has been extended, shall be deemed to be service rendered in the corresponding grade pay/pay scale extended based on the recommendations of the Commission except where there has been merger of more than one pre-revised scale of pay into one grade with a common grade pay/pay scale, and where this benefit will extend only for the post(s) for which that grade pay/pay scale is the normal replacement grade without any upgradation." 4. After the implementation of 7 th CPC, there are only a few cases of merger/upgradation of pay scale. It has been decided in consultation with UPSC that in cases where merger/upgradation of pay are not involved in the recommendations of the 7th CPC, the Note as referred above is not to be prescribed in the RRs/SRs. The guidelines in this regard have also been separately issued. The model notification includes a provision for deletion of the Note. 5. The Ministries/Departments are requested to finalise draft notification for amendment of the SRs/RRs in line with the model notification and thereafter, refer the same to the Legislative Department for vetting. The Legislative Department may dispose of references received from the Ministries/Departments within two weeks. Any amendment which is beyond the scope of the model rules will be finalized in usual process i.e. consultation with DoPT, UPSC and Legislative Department. 6. This Department is monitoring the implementation of the OM dated 09.08.2016. All Ministries / Departments are therefore requested to furnish information as per Annexure-III at the earliest. Sl.No. Post/Designation Whether RRs notification issued for amendment of RRs as per DoPT OM dated 09.08.2016.